Whenever I write about running coaches, bloggers, or running clubs, the interest is high. Gia qualified legitimately for Boston 2015. However she was pregnant at the time of the race, and could not run in Boston that year. She gave her bib to the friend. Her friend is a fast runner – and ran a time in that race that qualified Gia for Boston. 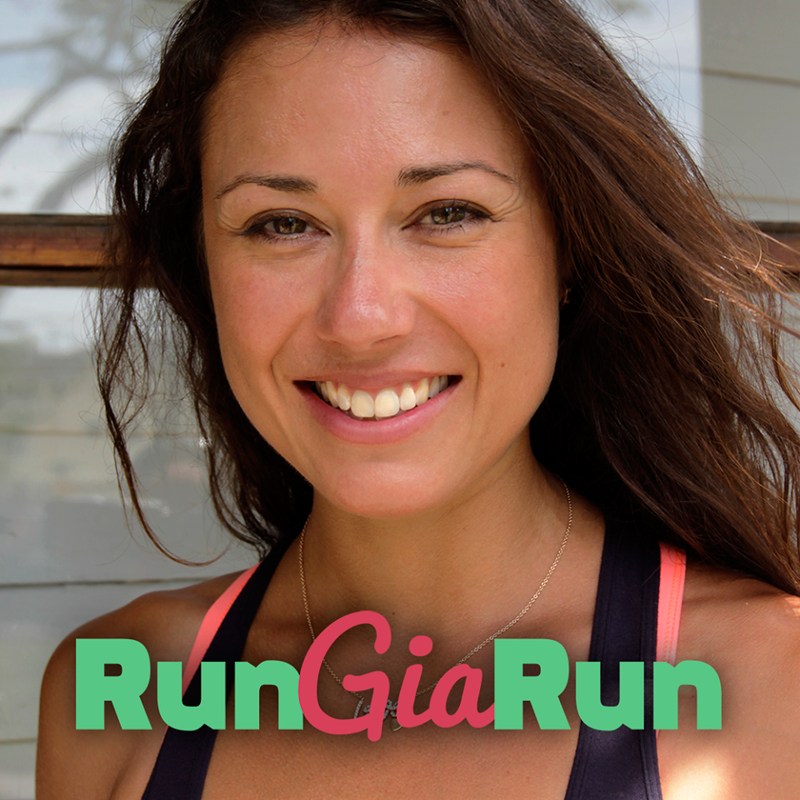 Gia used her friend’s time as her qualifier to register for the Boston Marathon in 2016. At least one of her followers knew that Gia did not run any marathon during the qualifying window for Boston ’16. When bib #s were assigned, she knew Gia’s was not obtained through a charity. At this point the tipster reported her suspicions regarding Gia to the Boston Athletic Association (B.A.A), The B.A.A. made the decision to permanently ban Gia from running in all future B.A.A events – banning her from the Boston Marathon for life. Gia posted about being banned on her blog. She posted that she was banned for giving her bib to a friend. this was only half true. The real reason for the lifetime ban was that she used her friend’s time to enter Boston ’16. I wrote a quick article explaining this, and it struck a cord with her followers and the running community. A couple days after I wrote my article, Gia wrote another apology, admitting to her mistakes, and fully coming clean. I shared her apology in a new article – and people generally moved on. I initially took a hard stance on the Gia Alvarez situation. Looking back on it a year later, I have softened a bit. She has not posted on her blog since her apology. I think she could still be in a position where she can have a positive voice in the community. She would be in a unique position to advocate for a change in the BAA’s deferral policy. I hope she goes back to posting at some point. the public, in general is forgiving to those that deserve forgiveness. I feel that Gia deserves some forgiveness at this point. Her mistakes showed some poor judgement and maybe a bit of naivety. She justified her actions internally feeling that she DID run a qualifying time and in her mind she deserved a spot in Boston. Her circumstances don’t excuse her decisions, but I think she deserves a chance at redemption. I even would go so far to say, that if she were to run a qualifying time, or raise enough money for charity, she deserves another chance to run in The Boston Marathon. By all accounts, Jane is a very strong runner. Her marathon debut in New York 2016 was impressive. She is qualified to run Boston 2018. Jane made a series of very bad decisions. From cutting the course, denying it initially, accepting the 2nd place award, covering her tracks, and not fully owning up to it. She posted an admission and an apology to Instagram, but since deleted her account. Like Gia’s initial apology, this admission wasn’t 100% truthful. 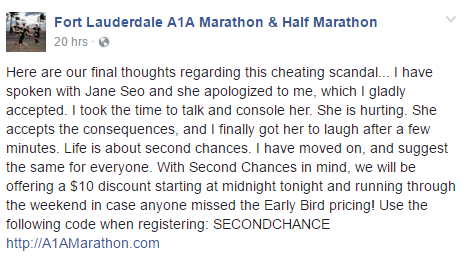 Even after the apology was posted, she wasn’t honest with me regarding her post race behavior. I’ve reached out to her, and my offer stands to post any statement she wants to make. Before I posted the article on Jane, I shared the story of ‘Linda’ with her, hoping it would motivate her to open up and come clean. the difference between her and Linda was that there were plenty of people already aware of Jane’s actions. However, Linda’s story is an example of how being honest can be cleansing, and how being caught can actually be a relief. I hope Jane can admit and apologize to those that matter to her in her life, and turn this around and treat it like a fresh start. I hope Jane can learn from ‘Linda’ and Gia that redemption is possible. As futile as the attempt may seem -if you look at the article I wrote about Jane, I never actually mentioned her by name. Through the Instagram posts and photos, I did not exactly protect her anonymity. She did already post that she cut the course to her 30,000 Instagram followers. But if you enter her name into a search engine, that article does not appear in the results. Nowhere in the article did I mention her education, or her employment (outside of the fact that her trip to Ft. Lauderdale was sponsored). However, when picked up by the mainstream press, that information was put out there. By the way, her last article for Huffington was in October of 2015. I left information regarding her education and her past at Huffington Post out of my article. I do always try to focus on only what is directly relevant to the cheating and any direct benefit a runner receives from the cheating. In the cases where I’ve found doctors or others in positions of trust cheating, I have stated their professions – but not their employers. Still, I will always receive criticism from both sides when I post. The very first comment I received on the article was from someone that said I needed to put her name in the title so it would appear in Google. There are comments that I should take the article down – that I am shaming her. I’ve been consistent with my guidelines and the criteria to make a post. I do not make a post as some sort of punishment. As such, I cannot generally back away just because something may have gotten bigger than appropriate. In this case the media felt this was a worthy news story, and ran with it. I was a guest on Real Runners of Atlanta podcast. (RROA). Please click the link and give it a listen. 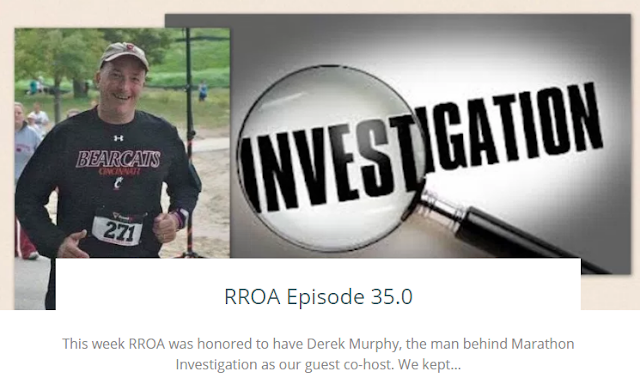 We talk about a variety of topics related to race cheating and my site. Most of this is light, but they do ask some very serious questions that relate to my articles and my site. I’m sure you will find it interesting. 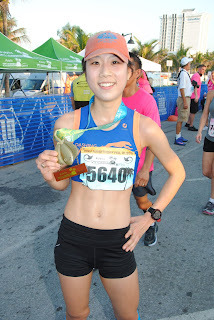 To support the blog, and my efforts to keep race results clean, please consider a small contribution. These donations go towards purchasing race photos, compensating the volunteers that work to pull data, and general expenses associated with the site. I was thrilled to find this blog and see the work you've done to help eliminate some of the cheating that occurs at marathons. I've read every article in your blog and have been impressed by your investigative thoroughness, and the readability of the stories. Even more important is your empathy and concern towards runners who have cheated. It would be easy to be mean spirited when a cheater is discovered, but you keep your writing factual and even keeled. Thanks for providing this service, it is very much appreciated! I was anticipating an article of this nature following the massive response to your last post regarding Ms. Seo. Your point regarding the scale of the response from media was particularly well taken, the response of media (however overblown and inappropriate) to a runner's actions is not the concern of your blog; you presented facts and exposed an injustice to the running community, how others respond is another matter entirely and not your responsibility. Keep up the good work! Sorry but both of these people do not deserve forgiveness or redemption! Gia has always played the victim card. Are we really suppose to believe in fairy tales that she gave away her bib to a "friend" with the idea that "I gave it to her with the thought that someone should love the bib." That "friend" who happened to be a runner, and that runner actually took the bib and ran the race? Give me a break! Gia is almost as bad as Jane-who cheated, felt the heat of being caught, tried to cover her tracks, got caught, and gave us a fairy tale about not feeling well! But, well enough to bike 13.1 miles after running 11 miles that morning. All these cheaters can go to hell! The Disney cheaters who use a mule to get into earlier corrals are maybe the worst because they block/slow down other runners because they are walking the damn race from the start! We do not need to extend empathy more second chances to either of these individuals. They both willingly tried to cheat the system and in the process their actions undercut the integrity of the sport. Gia wanted to get a free pass into Boston using her friends time. She didn't want to put the time and effort into requalifying in spite of the past obstacles that she had faced. Well guess what? Other runners go through the same complications and they don't decide to use fraud in the form of bib mules. Jane Seo was unable to meet the expectations of her sub-elite running club and thus she decided to circumvent a race course and pass it off as a good performance. We cannot tolerate that. You have no guidelines. everything subjective with you. You make excuses when you do the wrong thing and never do the right thing. Your whole point of this venture is to shame people and a bully people. But your worst offense is to constantly going let'srun and post your articles under different names to get more people to come to your site. In most ways you are no better than the cheater and actually worse because you try to profit off it. I despise Derek and his methods He's very selective in the articles he posts. He seems to delight in attacking women and their efforts. I'm sure he and Trump would get along very nicely. You are entitled to your opinions. But be careful with your 'facts'. Ask yourself what you are hoping to accomplish. You've been trolling for almost a year. You've thrown out allegations that I've cheated at races..laughable. I have never posted an article under another username on letsrun. I'd love to have this debate offline with you. You know how to reach me. I'd reach out to you, but it seems you have blocked me on social media. I'm surprised to learn that because Derek has posted about plenty of men in the articles I've read. It sounds like you've made a careful study of the gender ratio of the cheaters he has exposed. Would you mind sharing the results with the rest of us? Thanks! I still struggle with how to view these people simply because cheating and seeking short cuts are revolting concepts to competitive athletes (pro or amateur) with the least bit if integrity. When viewed through that lens then the consequences experienced by both runners seem justified. I don’t know about the life ban for Alvarez but that was most likely issued to make an example for others to see. Running is a moment to moment thing People work assiduously to get into (and stay at) the kind of shape necessary to compete at the world class level so just because a person qualified a couple of years ago isn’t a pass into a later event nor should it ever be. I say this because some of the stronger Alvarez supporters will say “well she clearly was good enough to get into Boston” when I’m like, “err not so fast”. Maybe I used to be “good enough for Boston” but then over just a two year period I lost a step or two and that was that. Some say that Alvarez was an “accidental” cheater though I still can’t buy into the idea that a given runner would be comfortable using the qual time of another under any circumstance. With Seo, well don’t what to say there except that she cheated and attempted a coverup and only later issued an apology when it was apparent that she had been found out. I don’t consider her actions as just a series of misunderstandings or the result of having a bad day or having been caught up in the moment. In the end I do NOT think that the harsh personal comments towards any of these people who cheat are warranted. Keep it in the realm of running if it’s going to continue at all which brings me to a point. I’m posting this in 2018 late Summer only because the issue of ethical running is still very present. People discuss these things a lot because runners are always scrutinizing the winners of even very small running events in an attempt to catch the next cheater. There is a level of paranoia in running now that wasn’t there before which its probably not a good thing. However, when you have people who are either “pushing the rules a bit” or are outright cheating them then it’s gonna be a natural by product.